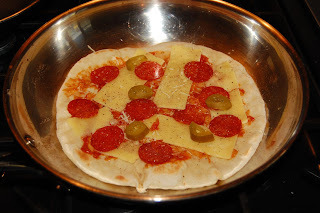 Beautiful Pizza – SO quick and easy! I need to slow down and think about this, because I’ve just made a lunchtime snack that you’d probably pay Pizza Express a tenner for. And I reckon the ingredients cost me 43p… yes, and I reckon I could be exaggerating a bit. 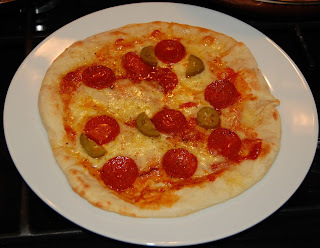 For your edification, here is the key to fabulous, cheap, quick pizza. Take a piece about the size of a child’s fist from the dough and roll it out on a floured surface, as circular as you can make it, to about 3mm thick. Go get your toppings sorted out (the dough will benefit from you giving it quick breaks as you roll it out, since the gluten is what makes it elasticy and stops it stretching as we want it to do). 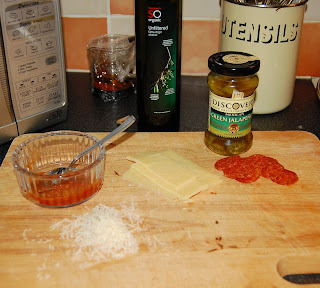 These are what I put on – few bits of thinly sliced cheddar, bit of grated parmesan, some thin slices of pepperoni, couple of jalapeno chillies and a desert spoon of tomato ketchup with something added. 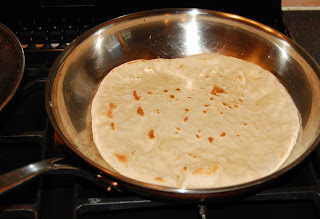 Now finish rolling out your flatbread/pizzabase and drop it carefully into a heavy-based frying pan, that you’ve heated up on the hob ’til its pretty hot – I’m talking medium to really hot really. Cook the dough base by dry-frying it, turning twice until its got brown spots, but is still mainly white and soft. Keeping the base in the pan, spread out the tomato sauce thinly across the surface of the pizza base, leaving the traditional edge free of sauce. Add your cheese and toppings, some freshly-ground black pepper and a drizzle of olive oil (this last part is actually quite important). Did I mention, stick the grill on high at the same time you started heating up the frying pan in which you cooked the dough base? 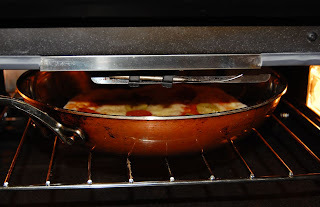 Now stick the topped pizza under the burning hot grill for 1-2 minutes: it shouldn’t need any longer than that to get the cheese fully melted and the pizza ready for the table. Soon as its done, serve that bad-boy and enjoy the fruits of your labours! If you’re quick, the whole thing will have taken about 5-6 minutes of cooking time. In case you’re curious about the ‘fridge dough’, its just 50% strong white, 50% plain white flours, with the standard 4% (by weight of total flour) fine sea salt, 2% dried yeast and 62% water. Make it by hand, make it in a mixer, only thing to keep in mind is that the dough’s gluten wants to be properly developed before you fridge it, and that it will probably keep growing a bit even in the fridge, til the yeast is fully inactive. One Response to Beautiful Pizza – SO quick and easy! Lovely! First time I’ve ever made pizza, usually buy frozen pizza. This was so simple to make and v tasty. Thanks Marcus!